A family in Texas has filed a lawsuit in Harris County against PJ Trailer Manufacturing Inc, stemming from a deadly crash that took the life of a 54 year-old woman last year. On June 11, 2014, the woman was driving to work in Houston when she slammed into a flat deck trailer that was blocking all lanes of the interstate. The vehicle went under the trailer and she suffered severe head trauma. She died in a coma four months later. The lawsuit claims that if the trailer had been equipped with a side under ride guard, the accident would have been relatively minor. The attorney for the plaintiffs says that the trailer industry has ignored the dangers of side impact collisions on trailers for decades. The National Highway Traffic Safety Administration has recommended making side guards mandatory on trucks since 2014. Side guards are required on most trucks in Europe and Japan. The NTSB also has recommended that rear guards on trailers be strengthened as well. Our truck crash injury lawyers in Virginia are glad to see that there is pressure on the trucking industry to install side guards on trailers. Rear guards on trailers save many lives per year, and it seems likely that side guards could also be a real life saver. Many people who crash into the sides and rears of trailers end up with severe head trauma which can affect them for life, or kill them. 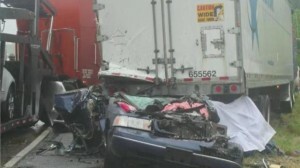 We hope that the US trucking industry eventually adopts life saving side guard technology on trailers.